We’d love your help. 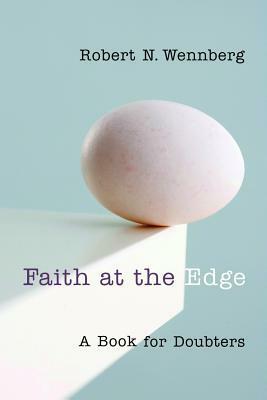 Let us know what’s wrong with this preview of Faith at the Edge by Robert N. Wennberg. To ask other readers questions about Faith at the Edge, please sign up. This collection of thoughts on 'the dark night of the soul' is short and some parts are too simplistic and not particularly helpful, but it is all gently written and reassuring. There were many excellent reminders and encouraging insights. 1. There is a reason for God choosing to withdraw His presence, or to let us experience agonizing questions and doubts. One reason may be to rid us of pride and self-assuredness, and give us humility. 2. We must keep on in This collection of thoughts on 'the dark night of the soul' is short and some parts are too simplistic and not particularly helpful, but it is all gently written and reassuring. There were many excellent reminders and encouraging insights. 2. We must keep on in the practice of charity, and we must never forsake the means of grace even when they are dry and unreal. Prayer, praise, preaching, fellowship, and the Sacraments are not only for times of vibrancy of feeling but a commitment we must follow all our life. 3. Doubt is not unbelief, it is uncertainty - and Hope plays an important role during these times when we lack the sure confidence that we once felt. We put our trust in what we earnestly desire to be true, what we place a high value on, in what have chosen to believe and commit ourselves to. Like Jacob, we must never give up the struggle to find the answers and understanding we seek. "I will not let you go unless you bless me!" Dr. Wennberg was one of my favorite college professors. He encourages us to think of ourselves as "believers tempted to doubt, not doubters tempted to believe." His work is theoretically and practically helpful for anyone who has experienced "the dark night of the soul." This is a pretty short text, which is nice, and it doesn't hammer its point, which is also nice. Wennberg is very clear that this is a book for those who are doubting within the faith; he's not writing to those who are skeptical about the whole thing, because that's a different kind of conversation. He's actually very clear about most of the parameters within which he's working, which the academic part of me appreciates. Wennberg's book isn't the best thing since sliced bread, for sure, but it d This is a pretty short text, which is nice, and it doesn't hammer its point, which is also nice. Wennberg is very clear that this is a book for those who are doubting within the faith; he's not writing to those who are skeptical about the whole thing, because that's a different kind of conversation. He's actually very clear about most of the parameters within which he's working, which the academic part of me appreciates. Wennberg's book isn't the best thing since sliced bread, for sure, but it does act a s a fantastic starting point for deeper conversations and understandings. He points you to the darkness within Mother Teresa, to the brilliance and lostness of St. John of the Cross, and to the heart of G.K. Chesterton (one of Wennberg's literary heroes, which I can understand). This is a good starting place, because whatever it doesn't get into (which is a lot) it at least has signposts for. This is a book for doubters, those who most likely grew up inside the Christian faith but have questions. I sought this book out because I was looking for something to help me through my own doubts. And while I appreciated some of the things Weinberg discussed, like not letting doubt completely overtake your life, the text was written in such dry textbook language it was a slog to get through. Reading this felt like reading a textbook on the philosophy of doubt. And it wasn’t really the book I w This is a book for doubters, those who most likely grew up inside the Christian faith but have questions. I sought this book out because I was looking for something to help me through my own doubts. And while I appreciated some of the things Weinberg discussed, like not letting doubt completely overtake your life, the text was written in such dry textbook language it was a slog to get through. Reading this felt like reading a textbook on the philosophy of doubt. And it wasn’t really the book I was looking for. I guess I had hoped for an anthology of several doubters, the different forms their doubts took, and how they either continued with their faith or gave it up. simple, refreshing, encouraging. I recommend this for anyone who has, or knows someone, who struggles with "the dark night of the soul", which is explained as being far from unbelief, but a pulling away, by God, of ones overwhelming sense of certainty. He describes this as being a form of asset, however painful, in growing humility and in tenacity of respect for God. A superb reflection on doubt in the life of faith. This is a fantastic book. It's a short book that broadly covers topics without going into depth, but I did not find it to be a shallow reading at all. Really good. Straightforward, simple, helpful. Will revisit. great book on doubt, what it means to your faith, and how to deal with it. This was a really good book by one of my teachers at Westmont. I like he acknowledges the challenge of doubt and how to deal with it.